PHOTO BY R.S. 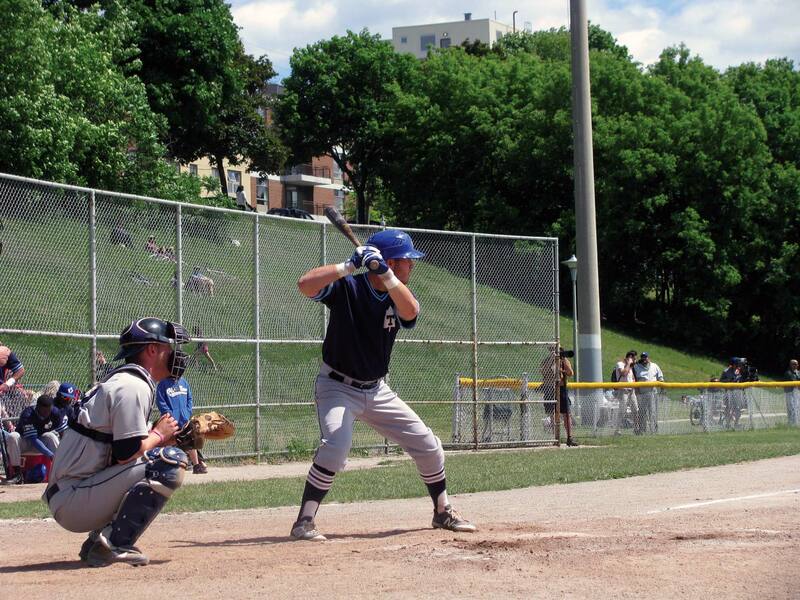 KONJEK/GLEANER NEWS: Ryan White takes a turn at the plate during recent baseball action at Christie Pits. White’s home run in the bottom of the ninth sealed a 13-10 comeback victory for the Toronto Maple Leafs over the Burlington Bandits on June 8. For 48 seasons, the Toronto Maple Leafs have been playing baseball at Christie Pits. Hoary old-timers with the longest of memories will tell you that at least once for every one of those seasons, they have watched the Leafs stage an epic comeback victory after falling way behind in a game. Seen it with their own eyes, honest. The hearty fans that remained clustered around the slopes of the ballpark buzzed in anticipation. It was happening again. The Leafs play ball in a hitter’s league. The fences at the Pits are short and cozy. An inspired team could score runs by the bushel. There is no reason why the home nine couldn’t mount a late rally to overcome a deficit of four, six, or eight runs. How about a deficit of twelve? Such was the case during last year’s Intercounty Baseball League playoffs, when the Leafs came all the way back from a 12-0 score to defeat the Brantford Red Sox 16-15 in one of the most memorable games in Christie Pits history. These miracle comebacks, they do happen. There is a mystique to Toronto’s famous sunken ballpark. It says that no lead is ever safe and no game is ever done while the Leafs are still at bat. That old Christie mystique was in evidence on June 8, when the Leafs hosted the Burlington Bandits. The Leafs fell behind early. After eight innings of play, the Bandits enjoyed a healthy 10-4 lead, and the Leafs were down to their final three outs. June 8 will go down as one of those games when the Leafs came all the way back. Online readers will want to open another window now and cue up some Wagner, Berlioz, or the theme from Rocky. The Leafs came up to bat, and the wheel of fortune spun hard. A walk. Another walk. A two-run double. Four more walks, then another double to tie the game 10-10. The hearty fans that remained clustered around the slopes of the ballpark buzzed in anticipation. It was happening again. The next man to the plate was Ryan White, the team’s second-year shortstop. White’s rookie season with Toronto had been cut short by a knee injury. He did not play again until this summer, and now the spotlight was trained firmly on him. Bottom of the ninth, two out. The game rested on his shoulders. It was do-or-die time. Clichés circled like bees. He was about to live the age-old dream played out by countless kids in countless backyards. White dug in. The moments that followed would be memorable, not just for him but for his teammates and everyone who was there to bear witness. Burlington’s pitcher served up just the thing, and White did not hesitate. First pitch. Gone. A walk-off home run — the most electrifying moment in baseball. With a crack of the bat that resonated like a cannon shot, the game was won 13-10. Did he know he had hit a home run right away? As he circled the bases, White’s teammates poured onto the field and surrounded home plate to receive the hero of the day. And with that, Ryan White added another chapter to the mystique of Christie Pits. His walk-off winner saw the Leafs continue their hot start to the 2016 season. As the month of June progressed, the Leafs stumbled into a win-lose-win-lose pattern. They approached the end of the month with a winning record, but only just. Hopefully things will turn out for the better in the month of July. 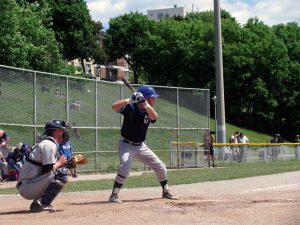 The Maple Leafs play ball at Christie Pits every Sunday at 2:00 p.m., with a handful of Wednesday night games, in June and July. As always, admission to Leafs games at Christie Pits is free.